Instead of picking up paper manuals at FICPA CPE events, you’ll be able to download the EZMaterials as searchable PDFs to your laptop, tablet or other device seven days before the event. Click here for frequently asked questions about FICPA EZMaterials. If five to seven people from the same firm or organization register for the same event (FICPA Simulcast, Seminar, Conference or Accounting Show), each registered person is eligible for a 15% discount off the registration fee. Or, if eight or more people from the same firm or organization register for the same event (FICPA Simulcast, Seminar, Conference or Accounting Show), each registered person is eligible for a 20% discount off the registration fee. To receive the discounts, the FICPA must receive ALL registrations at one time (not one at a time). Upon registration of five to seven people or eight or more people, then the respective discounts will be applied. These discounts do not apply to nonmember fees or late fees and they may not be used in conjunction with other discounts. Substitutions: A registrant may substitute another member up to the beginning of the first morning session of the presentation. If a nonmember substitutes for a member, the nonmember will be charged the applicable nonmember fee. Transfers: A registrant may transfer his/her registration to another presentation. Registrants transferring within 5 days of the presentation date are required to pay a transfer fee of $55. If transfer is within 3 days of the event, the registrant may also be subject to the cost of food and beverage purchased as a result of registrant’s commitment to attend said event. No Shows: No refunds will be granted for cancellations on the day of and/or after the event. Cancellations requested after the EZ Materials have been downloaded will not receive a refund. Cancellations requested more than 5 days prior to the course presentation date will receive a full refund, unless the EZMaterials have been downloaded. In that case, the fee is non-refundable. Cancellations requested within 5 days of the course presentation are non-refundable unless a documented hardship has been submitted and approved. If approved, a $55 cancellation fee will apply. If cancellation is within 3 days of the event, registrant may also be subject to the cost of food and beverage purchased as a result of participant’s commitment to attend said event. No refunds will be granted for cancellations on the day of the event. FICPA reserves the right to cancel an event for unforeseen circumstances or for insufficient enrollment. If your event is canceled, we will notify you at least five days in advance of the scheduled date. You have the option to transfer your fee to another event, to keep your funds in Money on Account or to receive a full refund. Please allow 10 business days for refund processing. AICPA members in good standing are eligible for a discount of $30 off of the course fee on select courses developed by the AICPA. To receive the discount, be sure to specify that you are an AICPA member in good standing when registering for an AICPA developed course. The discount applies to all 8-hour and 16-hour courses developed by AICPA and can be applied to the actual course fee. It is not transferable to other fees or surcharges. Discount must be requested at the time of registration. This discount will not be applied after registrations are received. The deadline for the Early Bird Price is moving from 10 days prior to an event to 30 days before the event. This change is an opportunity for the FICPA to better manage the costs associated with these events. Keeping prices low by better managing our costs allows us to keep registration costs as low as possible, so we can continue to bring you quality CPE at an affordable price. Remember to register for CPE events 30 days prior to take advantage of the Early Bird Pricing. That is a $55 savings! Courses may be canceled by the FICPA one week prior to the course date if they fail to meet the minimum attendance. In the event of a cancellation, you will be notified by phone and given the option of transferring to another course or receiving a full refund. The FICPA is dedicated to providing a comfortable and productive learning environment for participants. This goal can be achieved through ongoing efforts to protect nonsmokers and to help participants adjust to smoking restrictions. Smoking is prohibited in all FICPA CPE programs. “Smoking permitted” areas shall include areas allowed by the facility or by Florida law outside the classrooms. In addition, no smoking is allowed within the lunch areas. To maintain a comfortable and productive learning environment for participants, unnecessary distractions within the classroom must be avoided. All disruptive communication devices are prohibited from all FICPA CPE courses. In accordance with the American Disabilities Act (ADA), the FICPA will try to reasonably accommodate anyone disabled and in need of special services. Please indicate on the registration form if registering by mail, fax or Internet and someone from the FICPA staff will contact you. If registering by phone, please inform the Member Services representative. Special meals or other requests are handled on-site by the FICPA. Most meeting rooms vary in temperature throughout the day and generally are cool as rather than warm. Dress casually and comfortably; take a jacket if you tend to chill easily. Children younger than 16 are not permitted at FICPA CPE events. Attendance at FICPA events constitutes an agreement by the registrant for the use and distribution of the attendee’s image or voice in photographs or video (both now and in the future). The self-study course has been discontinued by the FICPA. The participant is dissatisfied with the program and materials and requests a refund or registration fee credit to apply towards another course. (Note: CPE credit may be issued). The participant is no longer interested in the course and has not accessed it. No CPE credit is issued. Contact the Member Services with any complaints regarding OnDemand products. These can be sent to msc@ficpa.org or by calling (800) 342-3197. For FICPA Chapter Meetings, please contact your local chapter for their specific policies. What is the Quality Assurance Service? 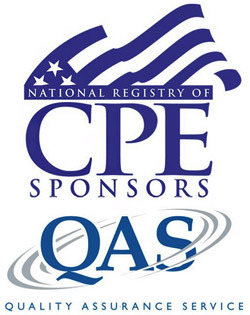 The National Association of State Boards of Accountancy (NASBA) has established the CPE Quality Assurance Service (QAS). QAS is a method for reviewing the standards and insuring the quality of self-study programs. Beginning July 1, 1999, the Florida Board of Accountancy required all self-study programs to be QAS approved to be eligible for CPE credit for Florida licensed CPAs.